-Is this the first time Taylor Swift has stepped in it? ‘Cause last night, she really, really did. Like, throw out those shoes, girlfriend; they’re ruined. Nicki Minaj was tweeting about her VMA snubs and suggesting that it was racially motivated, and Taylor weirdly inserted herself into the conversation and somehow made it all about feminism (which it wasn’t). Things got real weird, real fast. And within a few hours, the underdog narrative that Swift’s machine has spent so long building suddenly started showing cracks. 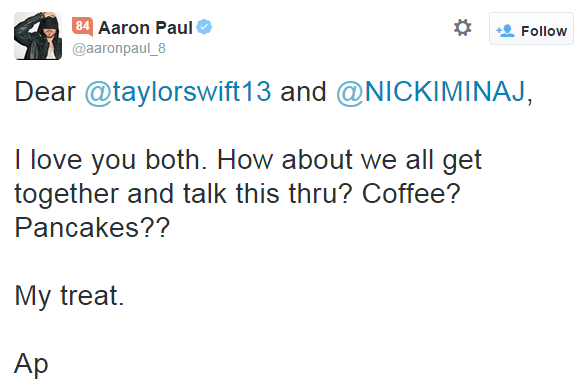 -Celebs were quick to jump in on the Swift vs Minaj convo, from Bruno Mars‘ hilarious response to Aaron Paul trying to be a peacemaker to professional mansplainer Piers Morgan hijacking the conversation. -The cheating allegations are flying on both sides of the Blake Shelton/Miranda Lambert split. Her camp is now saying that he’s the one who strayed, but a new blind item suggests that’s not the whole truth. (I’m guessing Kasey Musgraves is the up and comer referenced.) Access Hollywood is also claiming that she had a “long-term affair.” Whatever happened, they both sound pretty bummed about it. –Lindsay Lohan went swimming in lingerie, as one does. –Jake Gyllenhaal may be a grump in all his recent print interviews, but he remains the ideal talk show guest. Listen to this cutie pie talk about his beard or get slapped in the face and try not to hug the screen with your uterus. -The Lone Gunman are set to appear in The X-Files reboot? I’m a little hazy on the final seasons and what happened in their short-lived spinoff but didn’t they, like, die? -I don’t even remember the Anne Hathaway joke in Trainwreck, but at least she has a sense of humour about it. -This is an interesting look at why the year’s biggest Sundance hits (Dope and Me, Earl and the Dying Girl) both fizzled at the box office. Festival buzz is no longer enough. -I feel like James Corden is conducting his late night show exactly how most of us would if given the chance: looking at who is going to be on that night and then wondering “Which of my secret bucket list scenarios involves them?” How else to explain him dressing up as MC Skat Kat and recreating the “Opposites Attract” video with Paula Abdul? James Corden is all of us. -Want to work for Gwyneth Paltrow‘s GOOP? How comfortable are you having an office in a barn? -I never thought there’d come the day when there was too much naked Neville Longbottom on my timeline, but here we are. –Bill Simmons just landed a mega deal with HBO, and it sounds like part of it involves doing a TV version of The BS Report. It’s like the podcast, but even better ’cause it’ll be easier to fast-forward through all the sports talk! -The Freeheld trailer, featuring Julianne Moore and Ellen Page as a couple fighting for equal rights, looks fantastic. -Speaking of trailers, the Spectre trailer introduces Christoph Waltz as the latest Bond villain.